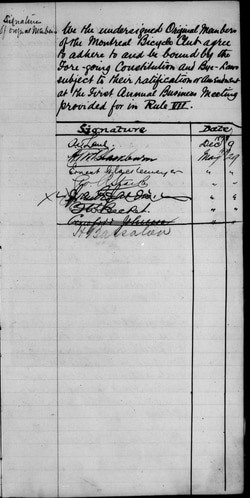 On 2 Dec 1878, Messrs C.J. Sidey and Horace S. Tibbs met by appointment at the house of the latter, 33 Chomedy Street in Montreal and proceeded to the business of forming a bicycle club. 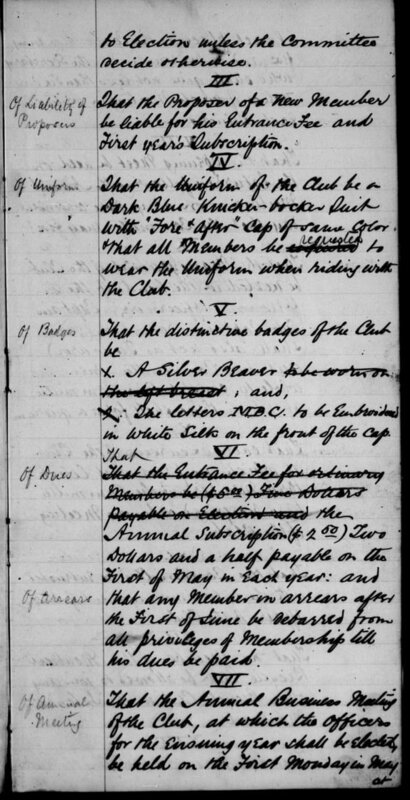 And it was resolved that Mr Sidey should hold the office of Captain till the said Annual Meeting and that Mr Tibbs should perform the duties of Secretary-Treasurer until the same date and should publish the fact of the organization of the Club and enroll "Original Members" who should append their signatures to the constitution and Bye-Laws as written below whose Entrance Fee should be considered due on signature. Annual subscription not to commence until the First of May 1879. We Charles James Sidney and Horace Somerset Tibbs both old Country Bicyclists, taking into consideration that a Bicycle Club should be formed in the city of Montreal have therefore worked to form an association to be called The Montreal Bicycle Club having the following Bye-laws which we hereby approve and ratify. I. That the club be called "The Montreal Bicycle Club"
III. That the Proposer of a New Member be liable for his Entrance Fee and First year's Subscription. IV. That the uniform of the Club be a Dark Blue Knicker-bocker Suit with "Fore & After" Cap of the same color. That all Members wear the uniform when riding with the Club. V. That the distinctive badges of the Club be A Silver Beaver, and the letters M.B.C. to be Embroidered in White Silk on the front of the cap. VI. The Annual Subscription ($2.50) Two Dollars and a half payable on the First of May in each year: and that any Member in arrears after the First of June be debarred from any privileges of Membership till his dues be paid. VII. 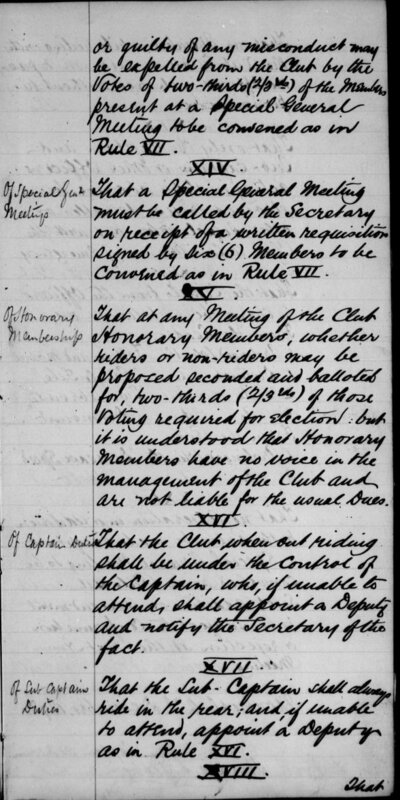 That the Annual Business Meeting of the Club, at which the officers for the ensuring year shall be elected be held on the First Monday in May at such a place as the committee may pick to be convened by the Secretary who will give not less than six days notice of such meeting in writing to each Member. IX. 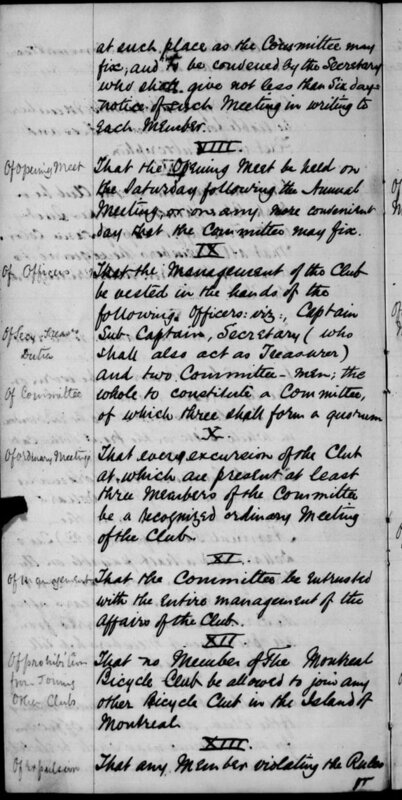 The the management of the Club be acted in the hands in the hands of the following officers: viz: Captain: Sub-Captain: Secretary (who shall also act as Treasurer) and two Committee-Men: the whole to constitute a Committee of which three shall form a quorum. XII. That no Member of the Montreal Bicycle Club be allowed to join any other bicycle club in the Island of Montreal. XV. That at any Meeting of the Club Honorary Members whether riders or non-riders may be proposed, seconded and balloted for two thirds (2/3) of those voting for selection: but it is understood that Honorary Members have no voice in the management of the Club and are not liable for the usual Dues. Horace Somerset Tibbs Secretary-Treasurer ""
Illegible crossed out ?? "" Illegible Johnson crossed out or replaced by ?? ""